Nourishes kidney, liver, spleen yin while tonifying kidney and spleen qi. Use for symptoms including weakness or pain in the lower back, restlessness, insomnia, burning in soles or palms, mild night sweats, dizziness, sore throat, impotence and high blood pressure due to deficient kidney yin. 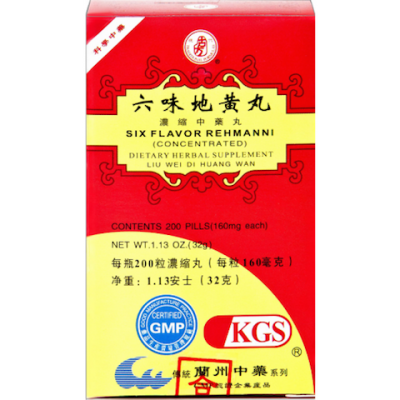 Ingredients: Rehmannia root 360 mg, Asiatic dogwood fruit 200 mg, Chinese yam rhizome 200 mg, Poria sclerotium 150 mg, tree peony root bark 150 mg, asian water plantain rhizome 150 mg. Directions for Use: Take 8 pills three times daily.